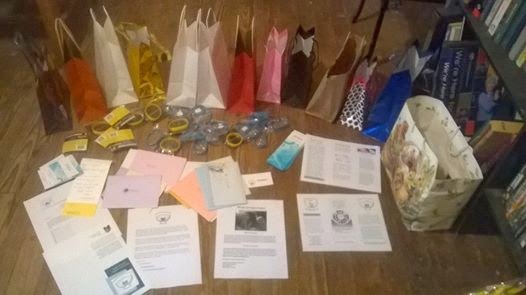 We successfully completed our Wings of Hope Project for March 27, 2014 give away, which consisted of 12 gift bags full of items that will be given to new patients at Shands Infusion Center for Women. We made up a nurses bag and threw some extra stuff in it, so the nurses can give them away to new patients. However, we need your help to continue the project and help us get ready for our next give away in December 2014. Let's try to get more than 12 gift bags for our next planned visit. We do as two times in year: April and December. This way, we can reach as many patients as we can during each year. We pick out local cancer clinics or nursing homes to bless with our donated gifts. Please take a moment to look around your house and see if you may have some of the items that we need, in order to make this project a success. Each time we visit them, the nurses are happy to see us because they do not have items give out to the patients at this time due to hospital rules. Ask your church, school, groups, clubs, or organizations to get involved and help us to continue to bless many patients with these gifts of love. For December’s give away, we will need at least 50 gift bags for men and women. We will also need 1 large gift bag for the nurses, so feel free to donate what you can. Anything that will cheer up a patient, men and women. Every new patient will get a bag until they run out. If you send a donation of any kind. Come on lets make a patient feel they are cared about and loved.